Fall off a cliff? Submerged in lava? Find yourself between a mama owlbear and her cub? Nothing to worry about since you’re protected by the Armor of Plot! 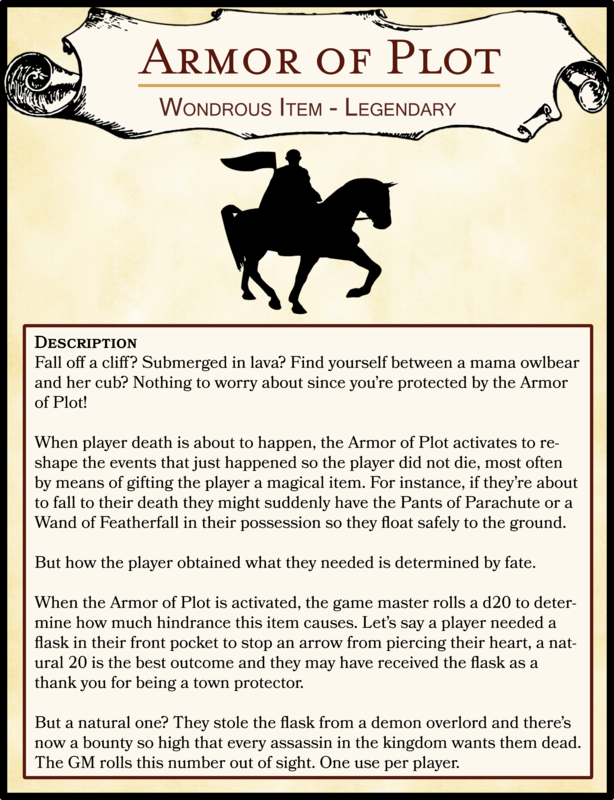 When player death is about to happen, the Armor of Plot activates to reshape the events that just happened so the player did not die, most often by means of gifting the player a magical item. For instance, if they’re about to fall to their death they might suddenly have the Pants of Parachute or a Wand of Featherfall in their possession so they float safely to the ground. But how the player obtained what they needed is determined by fate. When the Armor of Plot is activated, the game master rolls a d20 to determine how much hindrance this item causes. Let’s say a player needed a flask in their front pocket to stop an arrow from piercing their heart, a natural 20 is the best outcome and they may have received the flask as a thank you for being a town protector. But a natural one? They stole the flask from a demon overlord and there’s now a bounty so high that every assassin in the kingdom wants them dead. The GM rolls this number out of sight. One use per player.